It's another fab sketch this week - I do love working to sketches, I think it's my very favourite kind of challenge. I love seeing how each card made for the challenge is so different from the next. For example MichelleO and I have used the same stamp for this weeks challenge yet both cards are totally different. Both of us have flipped the sketch, but each in a different way!! Apologies for the bad pic, I hate these dark days!! The flowers are the same colour as the pomegranate colour of the paper (I coloured the flowers with Purely Pomegranate ink) yet they look tomato red in the pic argh!! I went with some gold mirri card to try and brighten up the card as it was so dull with the dark colours - not sure if I like it but I'm calling this one done now. The Sarah Kay image which I got from Sparklybits has been coloured with the usual distress inks/H2O's. 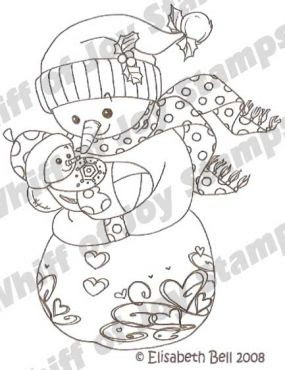 It's a fab image to colour - really quick and easy to do. The papers are Anna Griffin. I didn't have a narrow enough ribbon for the top of the card to break up the red so used the ribbon pattern off the paper and made a paper bow. I would love to pass these on individually but am so snowed under with work just now so if you're reading this and don't have either of these awards please help yourself lol. I hate doing this but if I don't combine challenges I will never do all challenges that I would like to do. 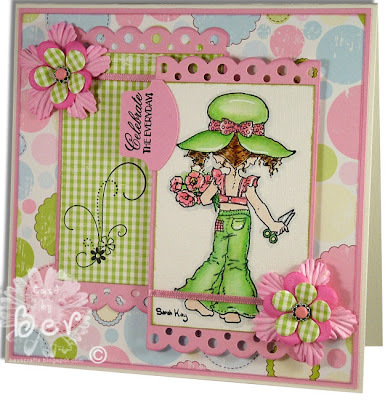 So, this card is for Mojo Monday - Julee has the most fab sketch (all her sketches are!! 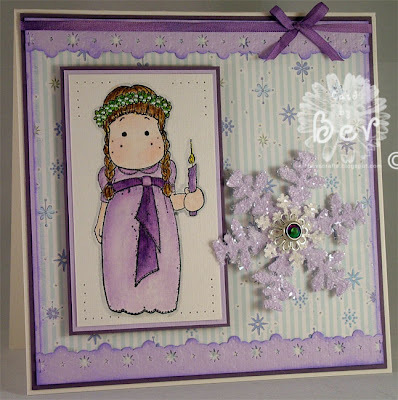 ), Our Creative Corner is Snow, Everybody Art is Winter, ABC is Snow (note the winter theme going on here lol) and Cute Card Thursday is Lilac. It's a colour I hardly ever use (why? I love it now lol) so had to scratch around for some paper with lilac in. The border punch is Martha Stewart - love this one as it punches and embosses and the ribbon was white silk which I coloured with H2O's - thanks for the tip Nettie, it worked a treat. I've also just realised this fits in LOTV challenge this week which is sprinkle and sparkle, the snowflakes certainly do that lol. I coloured the image with the usual distress inks and H2O's, and added Liquid Pearls for the Mistletoe berries in her hair. I used the Stampin Up pricking mat set to prick the corners. The snowflake is a cuttlebug die and Martha Stewart punch and I have coated the snowflakes with the most yummy crystal flakes that the Gorgeous Rach sent me. Thanks so much sweetie, I LOVE it xxxxx. 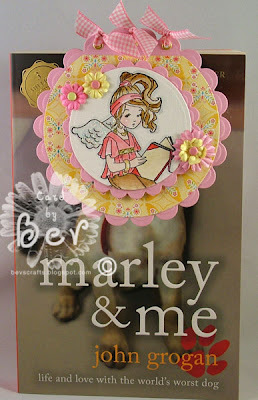 The idea is from Anna at Sassy and Sweet - she has the most amazing blog and I spend hours drooling at her work!!! The silver finding is from Eggstravaganza and the brad is Papermania. The DP is Karen Neuburger which I have had for about 3 years (shows how often I use lilac!!). I hope the close up of the snowflake shows the sparkle and texture from the crystal flakes. Looks like spun sugar!! The ever generous Katharina has once again given us some more candy to give away!! I have the Herb with Baby stamp and have added a few bits and bobs to make it a "pink" Christmas lol. All you need to do is link my candy on your blog and leave a comment here when you have done so. I will draw the winner using a random generator on Thursday 4th December. I will post worldwide and this is open to ALL, so if you don't have a blog leave a comment on this post, if you're leaving an anonymous comment please make sure you state your name in the comment. Dawny P has the most mega sketch for Papertake Weekly this week so I had to give it a try. 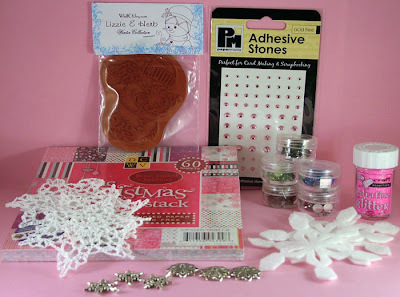 Mandy from Sparklybits sent me a few Sarah Kays to play with, they are so cute. She has also had a delivery of the new Magnolia Xmas stamps and has quite a few in from the Winter Stamp Club kit for those that missed out on it. I've coloured the image with the usual distress inks and H2O's. The new range of SK stamps definitely seem a lot easier to colour - not so intricate and this one stamped beautifully thank goodness. The sentiment is from the General Sentiments set by Whiff of Joy (how did I ever manage without these!!) 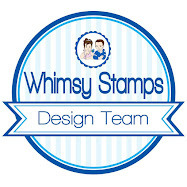 and the punch is by Stampin Up. Every 6 to 8 weeks, our DT members will receive a kit with a selection of Kadoodle stamps, papers and embellishments to make some samples. We will require the selected DT members to make and send us 3 to 5 cards/pages per kit (more if they want). These will be used as samples for the blog and the shop and might also be used for publication. - also tell us if you belong to any forum or other DT team, if you ever take part in challenges or have ever been published and any other information you think might be relevant. We will make a first selection and ask those entries to be sent by post for the final selection. Challenge 10 already!! The intention for this weeks challenge was to make a bookmark, but with it being such a busy time for us all we've opened the challenge up to anything but a card - so a wallet, altered notebook, bookmark, candle, door hanger .. the possibilities are endless and you get to make a nifty little gift into the bargain. 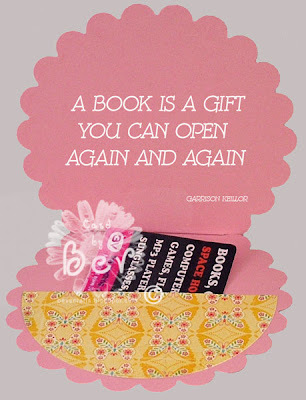 I started off with a bookmark that grew into a gift card holder from a bookshop so it's a bit of both lol. I cut another circle out of the DP (same size as the one on the front), trimmed it and attached to the inside of the bookmark. And there you go - Bob's your Uncle, you have a little useful keepsake that also holds the book token gift card. Melinda reading book by Whiff of Joy is coloured with distress inks and H2O's. When I started this card I had intended it for the fab sketch on Saturday Sketchers, decided to 3D the bear so it fitted the Saturday Crafter challenge, Dutch Dare calls for three flowers this week, three flowers I got and lastly Lili of the Valley challenge calls for four legged friends - and voila, a four challenge combo he he he! The Forever Friends image is coloured with the usual distress inks and twinklers. The ribbon I picked up at Dainty Supplies last week, love it!! The label punch is Stampin Up. The challenge this week is texture so I've used an embossed doiley, ribbon, stitching, flat back pearls, I've 3D'd the bells in the top corner and used glitter on the snowflakes and sentiment mat. 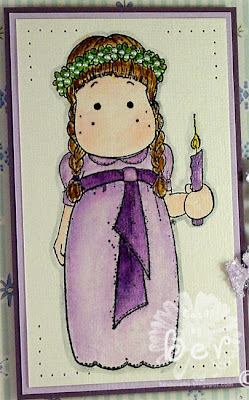 I've coloured Tilda from the Winter Stamp Club kit with distress inks and H2O's and I've stamped the green background mat with a canvas background stamp from Stampin Up. The sentiment is a Studio G set. 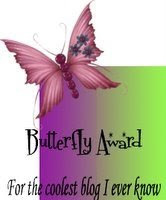 I have received this award from the lovely Anne, thanks so much sweetie, much appreciated. Wow, it must be award week this week lol. I received this lovely award from Kathy, thanks so much sweetie. As I have passed on quite a few awards this week I am going to leave these for all my fab blog readers who have not received either of these awards. Sorry I've been awol, not felt much like making cards this week and my mojo has gone walkabout big time!! It's taken me a couple of days to come up with this one and the more I fiddle and try to improve it the worse it's getting so I'm going to leave well alone now and hope I find that missing mojo soon!! The card is for Cute Card Thursday challenge which is Snow & Snowflakes. 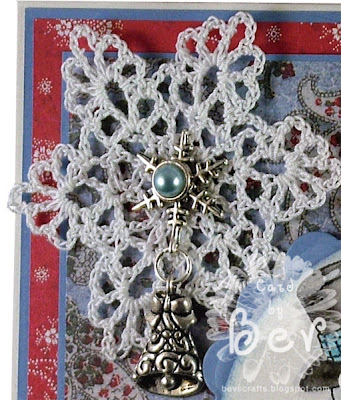 I think this Whiff of Joy Herb in love image is just so cute and wanted to use the snowflake that I have crocheted. I coloured Herb in love with distress inks and H2O's, with Sakura Stardust pens on the swirls on the couple. The sentiment is from Whiff of Joy Winter Love set which I stamped, cut into a rectangle and punched two little half circles in the centre of each short side to look like a ticket. I love the Autumn Leaves Ticketed but cannot justify the price so keep on window shopping lol. Charms and brads from stash. I received this award from the lovely Rach, Sandra, Scotspanda Camilla and Michele - thanks so much sweeties, I appreciate the honour!! This blog invests and believes the PROXIMITY- nearness in space, time and relationships. These blogs are exceedingly charming. 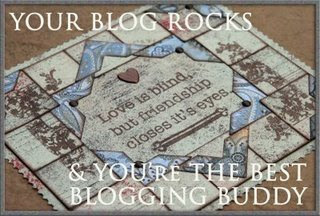 These kind bloggers aim to find and be friends. They are not interested in prizes or self-aggrandizement . Our hope is that when the ribbons of these prizes are cut, even more friendships are propagated. Please give more attention to these writers. Deliver this award to 8 bloggers who may then pass it on. I've seen this award do the rounds yesterday, so if you've already received this then your extra special :). 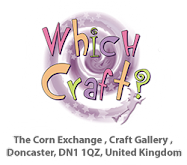 So, now I'm passing it on to Terrie, Kim, Natalie, Nikki, Chris, Kim, Catherine Suze and Kathy - these ladies are amazing crafters and inspire me no end. I have also received this award from Desire from Doing Life and am so honoured and touched to have been included in her line-up of amazing crafters! 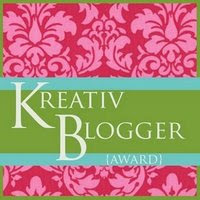 Link to DOING LIFE's blog, so everyone will know the origin of this award. Guest Design Team call - Whiff of Joy !!! 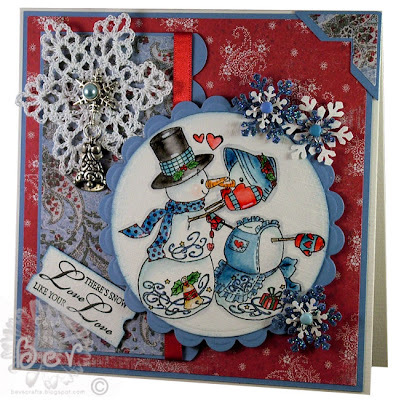 The current guest design team slot is sadly coming to an end - Aija and Suzy have made the most amazing and stunningly beautiful cards - all can be seen on their blogs and also in the Whiff of Joy inspiration gallery. 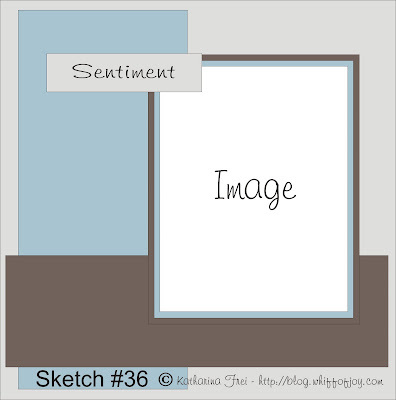 Heather has done another amazing sketch for us this week at Whiff of Joy challenge blog, I loved using it and will certainly use this one again and again. Designer Digitals had a sale on last weekend and these papers were amongst the whole bunch I bought to download (well, you just can't stop and one set now can you? ?l) Aren't they gorgeous papers!! And they print out beautifully too. H2O's - Pink Anthurium, Hot Cinnamon, Fern, Midori Green, African Jade, Bashful Blue. I'd forgotten just how much I love Willow with umbrella, and when I saw the Mojo Monday sketch I knew straight away I wanted to use her. 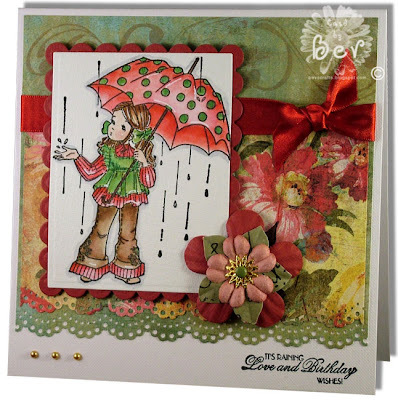 Then I saw My Time To Craft challenge is Rain this week - I had just the image and sentiment - perfect!! I also wanted to use these Basic Grey papers, I love the deep, rich colours so am also entering this card in this week's Sugar Nellie challenge which is flowers. Another perfect challenge for me seeing how much I love me flowers lol. I've deviated from the sketch slightly - I haven't put the 3 pearls at the top of the card, they looked lost and overwhelmed by the image so I've put them at the bottom of the card. Distress inks: Weathered Wood, Antique Linem, Shabby Shutters, Peeled Paint, Fired Brick, Tattered Rose, Vintage Photo, Walnut Stain. H2O's: Cinnamon Brown, Chestnut Brown, Cedar Wood, Poppy Red, Sunburst, Fern. The pearls are from Sally - what would I do without these!! The flowers (small and medium) are Prima, the large one is punched from the same card as the image mat and embossed with a ball tool to give texture. I'm so loving the winter club stamps, they are just so cute. I've done this card for two challenges, Ismaki has a fab sketch by Isa with the option to use blue and copper - a combo I've never tried but love!! and Papertake Weekly is snow. Anything snow related - snowmen, snowflakes, snowy scenes etc! 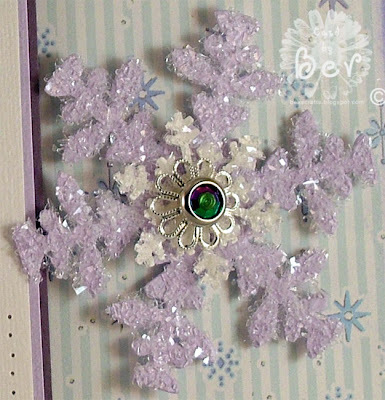 I just love these SU felt snow flakes and started the card off working around the gorgeous shade of blue (more like Soft Sky I think - my fav SU colour which was last year's "in colour". Such a shame it's only available for a short time. The copper mirri is reflecting the lights horribly so I will try and get a better pic tomorrow - if it ever brightens up out there!! H2O's: China Black, Cedar Wood, Chestnut Brownm Lemondrop, Buttercup, African Jade, Blue Ice and Majestic Blue. I coloured the cuttlebugged layer by inking up the inside of the embossing folder with Soft Sky ink and ran it through the cuttlebug. The sentiment is from a Studio G set punched with the 3/4" Stampin Up circular punch. 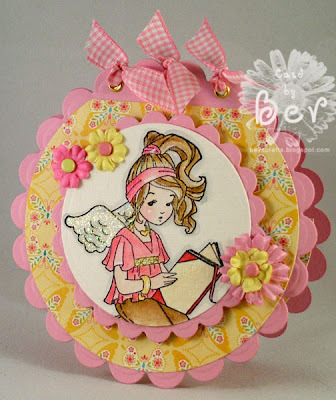 The corner is punched with the Stampin Up photo corner punch. The brad is from Papermania. Sarah Kay image coloured with distress inks and H2O's. I don't know who the paper is by - it's the last piece I had and used the part with the name on first. My Magnolia Winter stamp club is here!! Woohoo! Got me winter stamp club today and I'm in love!! How cute are these two little snoggers - bless!! 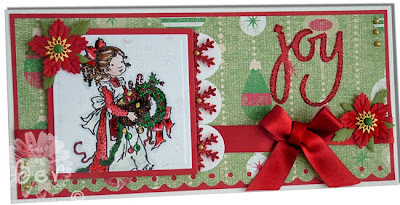 I'm entering this in Sketch Saturday challenge - these another fantastic sketch this week and am also entering this in Cute Card Thursday challenge which is red and green. I think the card base should have been green, the white is insipid so I may still pull it to bits in the morning. 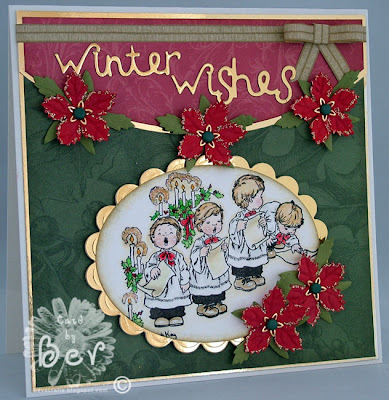 I've coloured the images with the usual distress inks and H2O's, the sentiment is from Whiff of Joy Winter Love set - how perfect is this sentiment with these little cuties!! The papers are Basic Grey Wassail - still not sure about the colours but it's done now. The snowflakes are punched with a Martha Stewart punch and the gold snowflakes are from Eggstravaganza - they have the most amazing gold findings and filigrees (Rach I got yours today lol). I get all my gold findings and filigrees from them - their selection is fantastic!! I've had to combine challenges again I am so behind (as ever!!) I'm entering this card in Cupcake Challenges "Spots & Dots", Spoonful of Sugar "a card for a child" and have used Dawny P's delish sketch for Paptertake Weekly challenge this week (although I've tweaked it a bit to add the ribbon). Spacers and brads from stash. The snowflakes stamped on the background are from a Rubber Stamp Tapestry set, which I have Glamour Dusted for even more bling lol.